The palatal expander “expands” (or widens) your upper jaw by putting gentle pressure on your upper molars each time an adjustment is made. 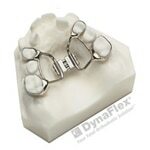 The steps below will instruct you about when and how to adjust your expander. When you achieve the desired expansion, you will wear the appliance for several months to solidify the expansion and to prevent regression. Step 1: In a well-lit area, tip the patient’s head back. Step 3: Push the key toward the back of the mouth. You will notice the fender will rotate and the new hole will appear. The rotation stops when the key meets the back of the expander. Step 4: Press back and down toward the tongue to remove the key. The next hole for insertion of the key should now be visible.